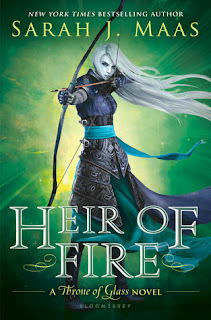 * This review contains spoilers for the previous books in the Throne of Glass series. To Sum It Up: Celaena has departed Adarlan for Wendlyn, where her secret mission is to gain any knowledge that can help her stop Adarlan’s king from plunging the world into darkness. This information won’t be easy to obtain, of course, and Celaena is also battling her grief over her dear friend’s death as well as a shattered heart. She can no longer hide from the past that she’s been trying to bury, either, not if she hopes to save everyone from the evil that is on the brink of invasion. Review: I could sit here for . . . forever, really, and still never cobble together the right words to capture the brilliance of Heir of Fire. Because how do you describe perfection? Five hundred plus pages of perfection that have left me unable to focus on anything but this book. Everything about Sarah J. Maas’s writing in Heir of Fire is nothing short of phenomenal. From the breadth of the world-building to the seamless introduction of some amazing new characters to the awe-inspiring development of the series’ returning characters—all of it will blow you away, nuclear blast-like. Maas not only addresses the fallout from the earth-shaking ending of Crown of Midnight; she also lays a solid-as-granite foundation for the future direction of the series. That’s not to say that Heir of Fire is a bridge book that merely serves to set up the next one. No, no, no. Most certainly not. Rather, the world that we were first drawn into in Throne of Glass just explodes outward, and it’s a world filled with Fae, witches, wyverns, and magic. The fantasy elements here ascend to dizzying heights that I’m still trying to wrap my head around. Celaena is utterly magnificent in this book, as is the way Maas has written her. Celaena is also utterly heartbreaking to behold in this book. A decade’s accumulation of anger and grief, freshly added to by Nehemia’s death and that business with Chaol that cut my heart like one of Celaena’s daggers, sends her to a breaking point of sorts. Compounding her anguish is the realization that she absolutely must confront her past and her true identity. Celaena has fought so many battles and emerged victorious, but the weight of her former life is as formidable as any opponent she’s ever faced. Do not, however, underestimate badass Celaena, because dear gods, whenever she appears, anyone or anything in her path of wrath had better run like hell or welcome certain death. Back in Adarlan, my beloved Chaol is going through a pretty tough time, unable to even discuss his troubles with Dorian because of the growing distance between the two. That saddened me just as much, and probably more, than the Chaol/Celaena split. Believe me, I totally, totally, totally want Chaol and Celaena to get back together, but I also need Chaol and Dorian to be brothers again. Did I mention that this book killed me repeatedly? Because it did. Adding multiple new characters with very prominent roles in the middle of a series is no small feat, but Maas pulls it off flawlessly. Rowan, Aedion, and Manon are all compelling, richly imagined characters with mesmerizing stories to tell. At first Manon seemed an unlikely character to warm up to. She herself says that she literally has no heart, but the fact that she’s such a unique, badass character makes it impossible not to love her. She makes the number thirteen the most badass number, too. The Game of Thrones fan in me knew that I was going to love Aedion when he was referred to as the Wolf of the North. That instinct proved to be resoundingly correct. And Rowan? Oh my God. That’s all I have to say because you have to meet him yourself to truly appreciate him. Obviously, Celaena, Chaol, and Dorian are first in my heart (especially Captain Westfall), but I am psyched to continue following the exploits of these three new characters as well. It’s been a while since I struggled this much to write a review, and I’m feeling very, very meh about what I have managed to write. Sometimes a book is so thoroughly amazing that no words of mine will ever be adequate to convey the pure joy of reading it. That’s how I feel about Heir of Fire in a nutshell, and now I must attempt to resume the life I knew before reading this. All in All: There are not enough stars in this universe or any others to give to this book. First, let me just say that your review was glorious. 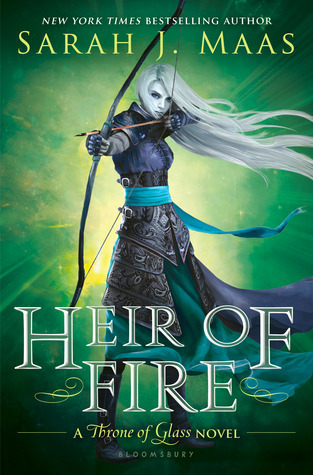 I know we all worry sometimes about our words not doing the thing justice but you managed to say all the things I wish I could have said (coherently) about the masterpiece that is Heir of Fire. Obviously, I could read an entire series just about the bromance, lol. I was so into EVERYTHING about this book that even though more Chaol would have been just fine by me, SJM definitely made the most out of every scene he was in. And the ending? AAAAHHHHHHHHHHHH!!!!!!!! I am all for assembling a support group for those who not only need ToG 4 right NOW, but for those who will also most likely be left wrecked by ToG 4! Magnificent is the right word. Have you seen the cover art for the upcoming book? Gosh it's so gorgeous! This series excites me to no end!! I await each new book in this series with Raven Cycle-like anticipation. Each ToG book just gets more and more impressive and intense and incredible. Manon was awesome, and I can't wait to see what role she and her Thirteen end up playing in the overall story arc! You've captured all my feelings on this book in your review! It's very well written! And the point you make about it setting up the foundation for an epic series while also being an amazing book on it's own is spot on. It's so fantastic that this book holds so much more information about the characters we already know and a world that I thought I pretty much knew too. And to introduce more amazing, nuanced characters! I'm so excited to see how this series will go, because I really have no idea! (I just hope certain people won't die!!!) :D It was so great to read your review Lee, awesome job! Aww, thanks Charlene! :D My thoughts were all over the place when I finished reading HoF; there was SO much to love about it! I'll never be able to rave enough about the expansion of the world and how brilliantly the new characters were brought into the story and without taking the spotlight away from any of the original characters, whom I love so dearly. I still have The Assassin's Blade to read, which I hope will tide me over a bit until we have the next ToG installment! Oh gosh this book. I can't get myself together enough to formulate a review. Rowan though, <3 love Rowan. That ending didn't make me too happy. I want Rowan on every page of every book. Me too, lol! Rowan was ... there are no words to describe his awesomeness!